...... .. ) without downloading them in your mail software (Like Outlook, Pegasus, Thunderbird, Lotus note, ...). 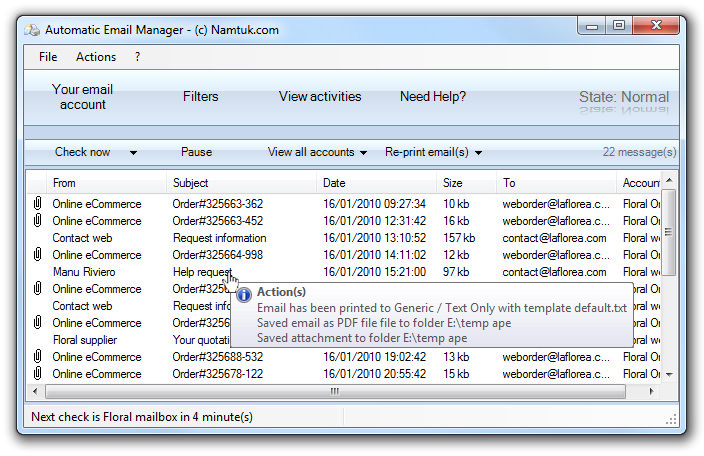 What will Automatic Print Email do for you ? Automatic Print Email, What can it do ? * Print new email without any interaction. This window is minimized into the task bar and works alone. Qweas is providing links to Automatic Print Email 4.15 as a courtesy, and makes no representations regarding Automatic Print Email or any other applications or any information related thereto. Any questions, complaints or claims regarding this application Automatic Print Email 4.15 must be directed to the appropriate software vendor. You may click the publisher link of Automatic Print Email on the top of this page to get more details about the vendor.